We are indebted to the Staffordshire Parish Registers Society book ‘Chebsey Parish Register’ complied in 1965 for the information below. Chebsey is a small village on the River Sow, lying 6 miles north-west of Stafford. Both the parish and the manor date back from Saxon times. At the time of Domesday Humfrey de Hastang held 5 hides in Chebsey of Henry de ferrers and the manor remaining in the Hastang family for several generations eventually passing though the female descent to Sir Humphrey Stafford who forfeited it when he joined Lord Lovell in the insurrection of 1485. The Staffords were eventually restored to at least part of this property and retained it until 1574 when it was sold to Robert Harcourt of South Leigh, Oxford. In 1617 it had passed into the possession of Henry Wolaston, citizen and draper of London and was still owned by this family when Walter Chetwynd wrote his history of the ‘Hundred of Pirehill’ towards the close of the 17th century. Later the manor passed to the Earls of Lichfield. Within the parish of Chebsey are the hamlets of Shallowford, Halfhide, Norton and Hilcote. Shallowford or Shawford was the home of Isaac Walton the famous fisherman whose book “The Compleat angler” is numbered amongst the classics of the 17th century. His cottage, now a showpiece, can still be seen beside the small stream where he used to fish. Nearby stands Hilcote once the home of the Noel family who obtained it from the Hastangs in the 12th century. Over the centuries the size of the population of this parish has changed but little. In 1817 there were 72 houses and 406 persons and a hundred years later this had only risen to 503. 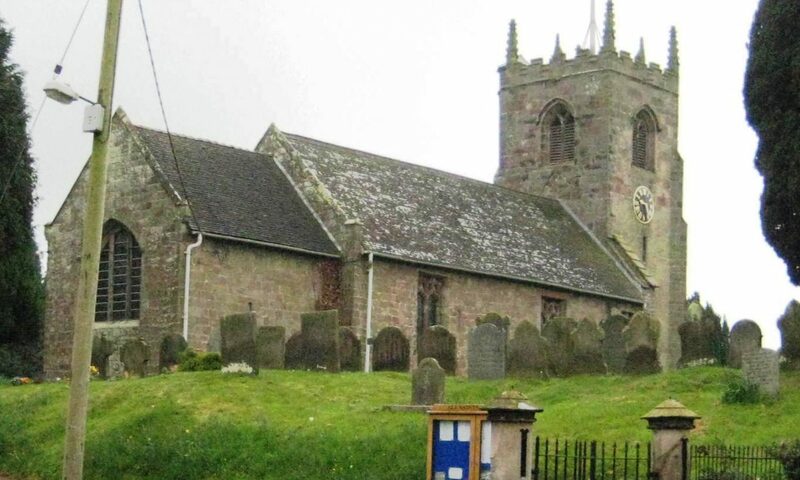 The church, dedicated to All Saints, stands on an eminence in the village and consists of a nave south aisle chancery and western tower. The living is in the gift of the Dean and Chapter of Lichfield. The church is a mediaeval structure extensively restored in 1897 and has 200 sittings. The earliest part of the building is the north wall of the nave and chancel which contains two Norman doorways and three Norman windows the latter, of the usual narrow type with wide internal splays. The existence of two doorways within the space of a few feet is curious and probably indicates an extension of the nave westward. The arcade and chancel arch are early English and the rest of the windows in the church perpendicular. The tower is also perpendicular in architecture and is unusual in that is has an outside staircase turret running to the top and forming a small corner tower. There are some very good carvings on the perpendicular features of the tower. Three of the bells in the tower are of pre-reformation date and two inscribed to St Mary and one to St Helena. The quaint south porch was added to the church in 1707. In the church are fragments of early tombs of the Noels of Hilcote and in the churchyard is a Saxon cross shaft, cylindrical at the base and rectangular at the upper part. The parish registers of Chebsey are very fragmentary. The volumes covering the period from 1538 to 1713 have long ago disappeared and the one containing baptisms and burials from 1732 to 1812 and marriages to 1754 was lost when one of the safes in the church was stolen in recent years with the loss also of some valuable 18th century communion plate.